I have extended my use of lettering and relief carving into memorial panels and grave markers for green burial grounds. These are designed to clients' requirements and are usually finished with linseed oil or Scandinavian Oil. 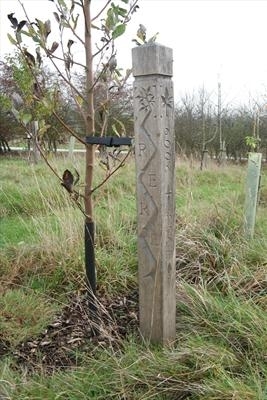 The lettering and carved details can be painted a suitable colour to contrast with the natural wood, but if unpainted should be carved robustly enough to remain clearly visible as the post weathers.